George Strait just celebrated his 61st birthday last week, but it is his fans who got the present. 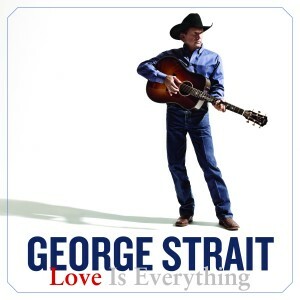 George released his 40th studio album, Love is Everything on May 14. Fans will not find any surprises in this new album. All 13 songs give us George’s laid back, easy going, southern sound that we have found in his music since his first album back in 1981. Like most of today’s country artists, George writes some of the music he sings. On this album, he wrote or co-wrote four of the 13 songs. The album starts off with “I Got A Car.” The song makes a point, without a lot of fanfare. It talks about what a simple introduction might lead. You see a pretty girl, walk over, and introduce yourself starting with the sentence ‘I got a car’. Listen to the song and you’ll find out exactly where that opening line might take you. The second song is George’s current single, “Give It All We Got Tonight.” It’s simply George doing what George does best. It can’t be classified anything but a love song. “Blue Melodies” could have been sung by Merle Haggard or George Jones, or anyone from our ‘older era of country music.’ But George Strait has his own way of making the song fit right in with the rest of today’s country music. George originally recorded the fourth song back in 1995, and it was part of his Strait Out of the Box album. “I Just Can’t Go On Dyin’ Like This,” is more proof that George Strait can take a song that is nearly 20 years old, and make fans fall in love with it all over again. ” I Thought I Heard My Heart Sing” is a song you can expect to hear in a dance club in the southwest. I don’t think this one will ever be released as a radio single. And, I’m not so sure it would do well on the radio if he did release it. But, I am sure there will be a lot of Texans kicking up their heels to this great dance tune. I found my ‘sing-a-long’ song with “That’s What Breaking Hearts Do.” There’s always one song on every album I review that I want to listen to more than once. And, that I find myself singing along with. ‘That’s what breaking hearts do, They cause you so much pain, Make you go insane, That’s what breaking hearts do’. Easy to remember lyrics added to a catchy melody definitely equals a sing-a-long with me song. “When Love Comes Around Again” is just what you would expect. It’s a song about looking at an old love in a new way. Getting someone back, giving it another try. I’ve already said that “I Thought I Heard My Heart Sing” is more of a dance tune than a ‘ready-for-radio’ song’. But, I did find one that I think George would do well to release to radio as his next single. The song is “the Night Is Young,” It’s uptempo, with almost a 1960’s rock and roll beat. He’s singing about a Friday night, a place to go, and big plans for what will be a fun-filled weekend. One of my favorites on the album. “Sittin’ On the Fence” would probably also work as a single. The music is good, the message is simple – when you’re coming out of a bad relationship, you may have trouble getting into a new relationship – even if it has the makings of being a great one. He follows that one with “I Believe.” I’m sure all of his fans remember, “I Saw God Today,” and in this song – like that one – George doesn’t mind telling us that when he’s at a low point in his life there is someone watching over him. 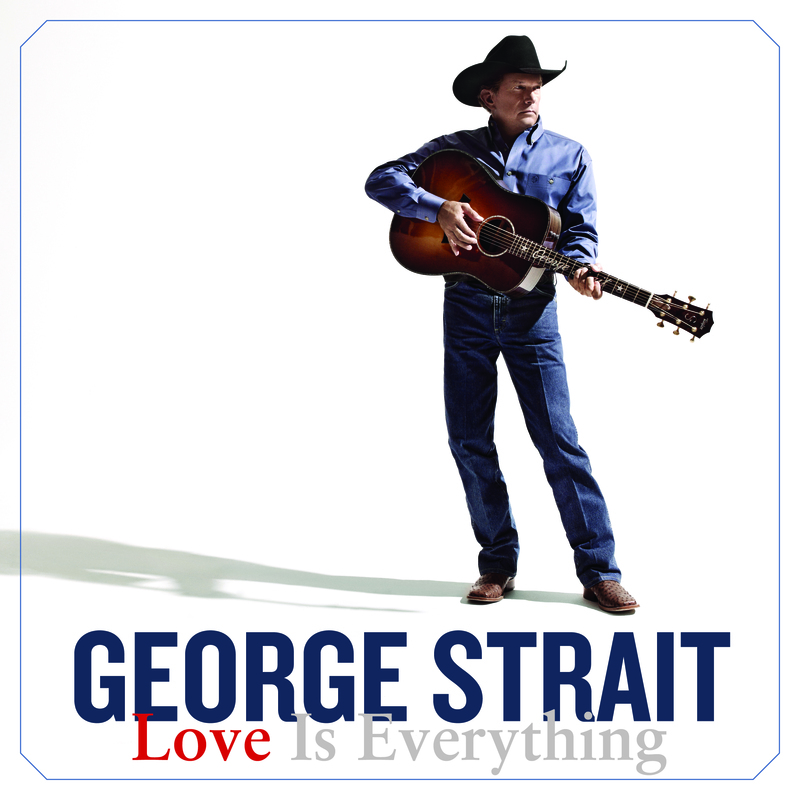 The title track, “Love Is Everything,” would make you think of George Strait, even if someone else were singing it. The song is his style, his music, and the great harmony is an added bonus. That brings us to “When the Credits Roll.” It’s a little look back at what George has done over the past 40 years. It’s full of mistakes, choices, and wondering … what will the critics think about all this “When the Credits Roll.” I don’t know how it would do as a single. But it is definitely a well-written song that deserves to be heard. George is currently on his final tour, The Cowboy Ride Again Tour, which will run through 2014. To check show dates, visit www.georgestrait.com. For the latest country music news, be sure to log on to www.countryschatter.com, and follow us on Twitter @countryschatter. Tagged Album and Artist Reviews, but it is his fans who got the present. George released his 40th studio album, CountrysChatter.com, easy going, George Strait Album Review by MusicChartsMagazine.com and CountrysChatter.com, George Strait just celebrated his 61st birthday last week, Love is Everything on May 14. Fans will not find any surprises in this new album. All 13 songs give us George's laid back, Music Charts Magazine Country Music Album Reviews, southern sound that we have found in his music since his first album back in 1981.